Joanne Doherty, a New Zealander with several Irish great-grandparents, arrives in Ireland a visitor and soon feels completely at home. Her story captures Ireland's beauty and history, and the wit, wisdom, and the unpredictable 'Irishness' of it's people - especially their craic. No other words can sum up the magic, the fun, the conversation, music and commotion of Irish people being together. 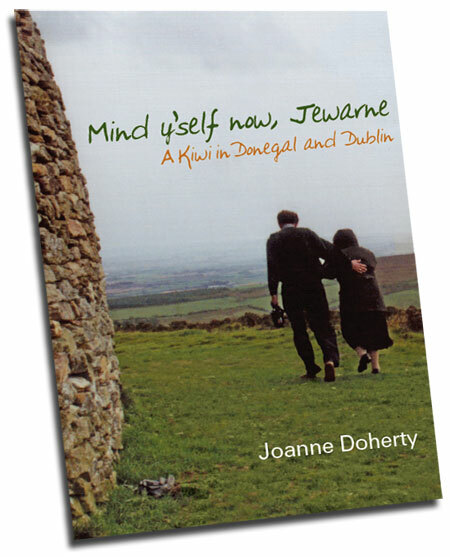 Of the many endearing Irish encounters, Joanne is charmed by the farewells - after numerous 'Bye, byes' and a sprinkle of 'God Bless', the final 'Mind y'self now, Jewarne' leaves her feeling warm and cared for. If you are of Irish descent, or just enjoy things Irish, this book is for you.